One of my tiny mice sunning on the carpet. He has come a long way from my first blue mouse. The tools of the trade: felting needles and roving. Tiny Easter bunny is ready to celebrate. Artmouse Creations makes fun beautiful sculptures of wool. 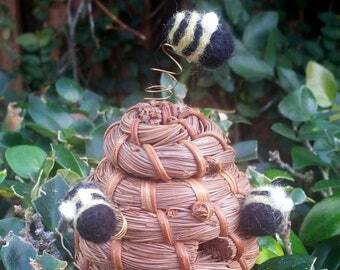 Welcome to Artmouse Creations where you will find soft sculptures made from wool. Every piece starts as wool roving and, with the help of a barbed needle (and lots of patience), become the pieces you can see here. Each piece is hand-crafted. This means your piece will be a one of a kind. Because they're made from wool with no foam cores, they won't disintegrate, even if your little one decides to give it a daily hug or sneak it outside to play (this has happened). It will make a great addition to your unique collection. Because it is important to support renewable, cruelty free sources and small businesses, the wool used here comes from small, family owned farms and woolen mills around the United States. The animals that give the wool for your sculpture have been well treated. Your piece is a labor of love from start to the finish. I got my start after a failed venture into drop spinning. With a lot of blue roving left, I came across a set of felting needles in a yarn shop. I learned to needle felt by making many little blue mice. The original blue wool roving and resulting mice are long gone but not my love of felting or wool. -Needle felting is an art form in which a mass of wool fibers are repeatedly poked (thousands of times by hand) with barbed needles. The barbs make the wool fibers intertwine, giving the wool shape. Due to the nature of wool, some fuzzing with handling is natural. My wool roving comes from small, family owned farms and mills around the United States. It's important to me to support renewable, cruelty free sources and small businesses so I check and ask questions. While I haven't had the chance to personally meet each animal (yes, I do pet them when I get the chance), I've been assured they are well cared for. -If you woolie should need to be cleaned, dab it with a cold damp cloth. Submerging it in water may cause it to further felt unevenly and alter its shape. After you have finished spot cleaning it, let it air dry completely. -Some pets love to play with wool. Your pet should be safe around the woolie. Your woolie, however, may not be safe around your pet, so make sure it is stored out of reach. What if my woolie is damaged? Repairs are possible! Wool is very resilient, so even if your woolie is damaged, all may not be lost. The repair fees are case sensitive, depending on the extent of damage and the woolie.